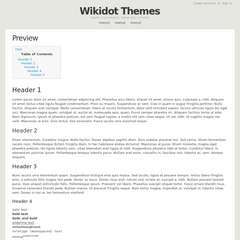 Super is a great new free theme for Wikidot, complete with custom buttons, comments, quote & code blocks, hovertips and owindows. The theme is super clean, super simple and super awesome (well, I think so). The theme is a fixed width of 960px, and in keeping with the simple layout, the sidebar is disabled. May 1, 2011: First release (v1.0). If you've noticed a bug with the theme, or would like to give some suggestions, just head over to http://css3.wikidot.com/contact - I'd love to hear from you. The theme is super clean, super simple and super awesome (well, I think so). It reminds me of the Scholar theme, and both look very easy on the eyes and cozy. I like it a lot!